Nigeria began their group campaign in Africa's 2018 World Cup qualifiers with a 2-1 victory away to Zambia on Sunday in pool B. They lead the way in the pool, after Algeria were held to a 1-1 draw by Cameroon in the same group. Elsewhere, Egypt defeated Congo 2-1 in Brazzaville in Group E and in Group A, Tunisia had a 2-0 win over Guinea. Nigeria's goals came in the first half from two of the English Premier League's rising stars. Arsenal forward Alex Iwobi put the Super Eagles ahead in the 32nd minute. 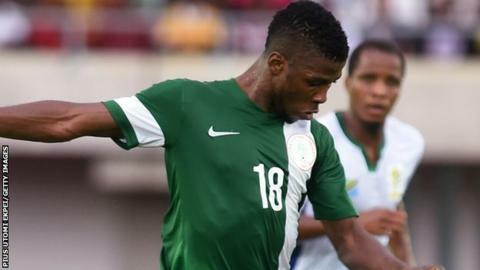 Manchester City striker Kelechi Iheanacho added a second 10 minutes later to put Gernot Rohr's side 2-0 up. In a fast-paced match in Ndola, with chances at both ends, Nigeria captain John Mikel Obi almost gave his side a 3-0 lead in the second half, only to see his long-range volley tipped over the bar by Zambia goalkeeper Kennedy Mweene. Zambia pushed for a reply and were rewarded in the 71st minute when Collins Mbesuma grabbed one back. Despite much pressure from the home team, Nigeria held on to record an away win to go top of Group B - one of the toughest in World Cup qualifying. The other two teams in Group B, Algeria, featuring Leicester City's Riyad Mahrez and Islam Slimani, and Cameroon played out a 1-1 draw. Algeria's El Arabi Soudani put the home side in front in Blida, but Cameroon's Benjamin Moukandjo equalised before half-time. Cameroon coach Hugo Broos was thrilled with his side's performance. "It's a very good result for us - because we played [away] against one of the best teams in Africa," the Belgian said. "The next game is in Cameroon against Zambia, so if we win that game we'll have a very good start." Also on Sunday, Egypt went top of Group E with a 2-1 victory away to Congo Brazzaville, following Ghana's 0-0 draw at home to Uganda on Friday. The hosts started brightly when France-based Ferebory Dore headed in the opening goal for Congo Brazzaville in the 24th minute. A strong Egypt side fought back with Roma star Mohamed Salah equalising four minutes before the break to make it 1-1. On 58 minutes, Salah turned goal-maker, setting up Al Ahly's Abdallah El-Said who scored to make it 2-1 to Egypt. Tunisia were 2-0 winners over Guinea in Group A in Monastir later on Sunday. Second half goals from Aymen Abdennour and Ahmed Akaichi gave the North Africans a victory which puts them second in Group A, behind the Democratic Republic of Congo who beat Libya 4-0 on Saturday. Also on Saturday, there were opening group wins for Ivory Coast and Senegal. Only the five group winners will qualify for Russia 2018.